Performance highlights for me were Sonia’s drum solo with Issam, American Cabaret style at its best – the flirtatious interchange between the two was infectious, and they both displayed unbelievable timing and riveting technique. Zoe Jakes‘ drum solo with Issam highlighted that Modern Tribal style isn’t just about looking Goth, you have to back it up with her amazing isolation and control, which she does combined with wry humour that had the audience at her feet begging for more. Petite Jamilla‘s gorgeous veil dance called “Wheel Within a Wheel” was mesmerizing as she spun around and around managing multiple veils and head spins, somehow making it all seems effortless. Finally, I loved the “South Pacific Bellynesian” routine – bellydance polynesian fusion which was brilliant fun, the Tahitian bump music making it impossible to stay still in your seat. After two hours of watching these supremely talented performers, I was getting that sinking feeling again. “Oh. My. God. There is NO way I will be able to do this.” But, I’m still going to take that class. I’ll let you know how it goes… in the meantime, if you see a crazy blonde girl practicing shimmies on the S4, say hi. A woman using the unfortunate name of Belladonna (well, unfortunate for people who try to find her via google) teaches and performs in this area as well. She was at the Crystal City Tattoo Tuesday event. There’s a number of pictures of her in the flickr set of my shots from the evening. I’ve taken classes both with Belladonna and at Saffron Dance Studio and I recommend them highly. 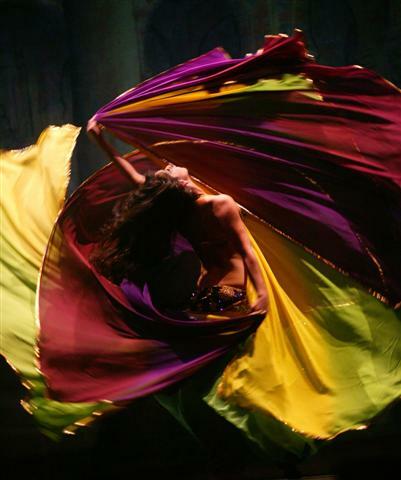 For people interested in getting a quick taste of Tribal Fusion belly dance, I recommend attending Tribal Cafe the last sunday of each month, be entertained, eat drink & be merry at Adams Morgan’s own Asylum.